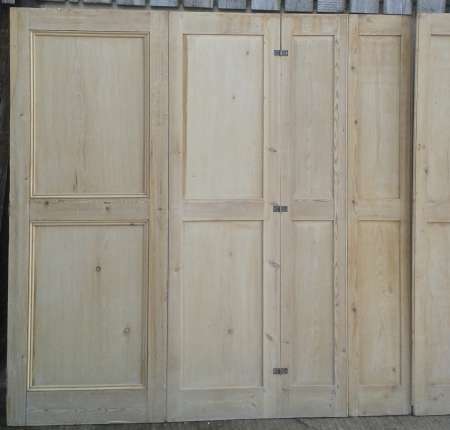 1990mm x 908mm x 45mm..
A good solid door – no rot. Victorian pine front door with original clear, green & cranberry “daisy” glass. 1970mm x 800mm x 45mm. A good quality reclaimed pine part glazed external door. 2122mm x 756mm x 37mm. 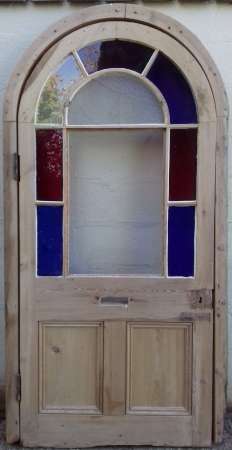 Victorian arched glazed door with frame – some glass missing & frame needs some repair to its base. 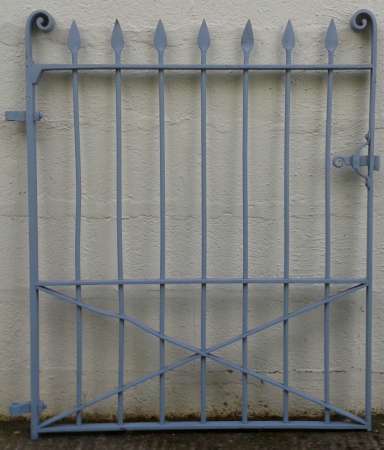 Door – 2010mm once leveled at base x 930mm x 48mm. Frame – 98mm in depth / will add approx. 130mm to doors width once installed . Antique ex-bank arched pine door. 2 available – see ADX015. 1085mm in width x 45mm. Height to shoulder/ apex – 1890mm/1953mm. 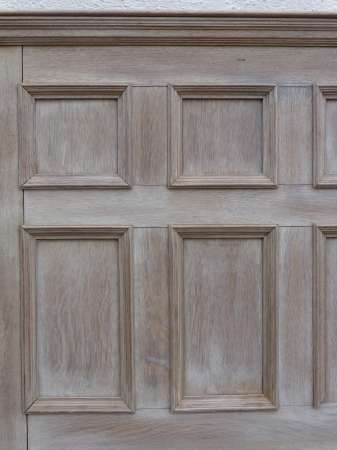 Victorian church door in pitch pine ( matches double doors DDX001). 2112mm x 795mm x 44mm. 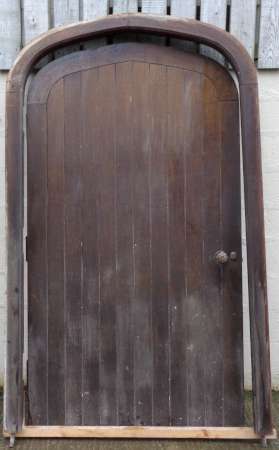 Victorian Arched church door in pine with original door furniture & box lock. Stripped & in very good condition. 2380mm x 760mm x 48mm. 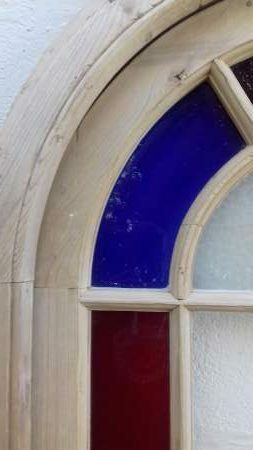 Victorian pitch pine arched church vestry door. 1817mm x 665mm x 42mm. Stripped – a good solid door. 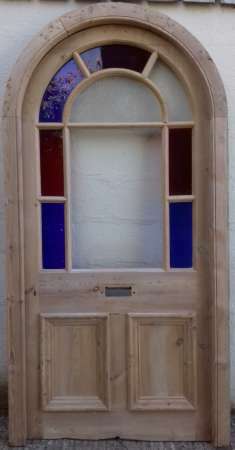 Part glazed Victorian pine door with original “daisy pattern” glass (hairline crack in one piece). 2055mm x 793mm x 40mm..
Victorian arched church door in pine. 2130mm x 700mm x 48mm. 944mm x 1946mm x 47mm. Large arched oak church door with its original pitch pine frame, brass hinges & door furniture. Door measures – 2320mm x 1267mm x 55mm. Frame measures – 2400mm x 1440mm. 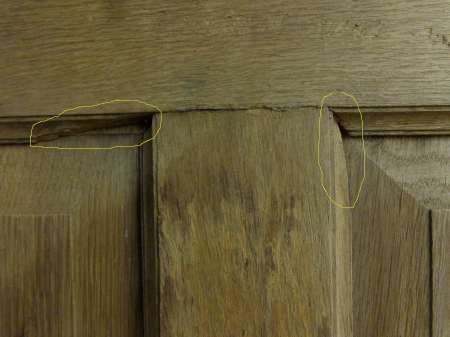 Was an internal door so in great condition – no rot & straight as a die! 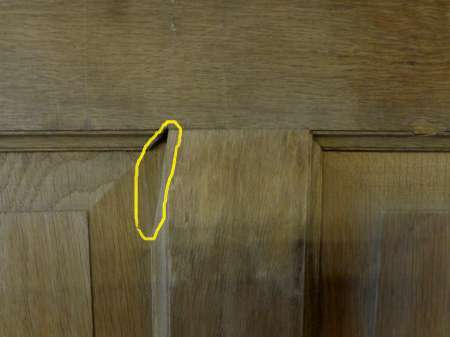 Arched oak door with latch reclaimed from army barracks officers mess. 2230mm x 835mm x 47mm. 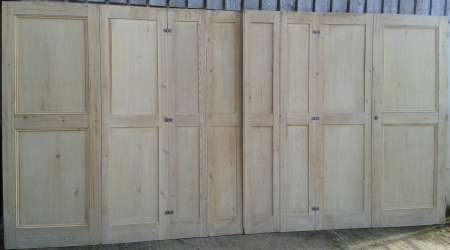 A well made reclaimed English oak external door with raised panels. 1966mm x 830mm x 44mm. Although clearly of some age this door has never been hung. 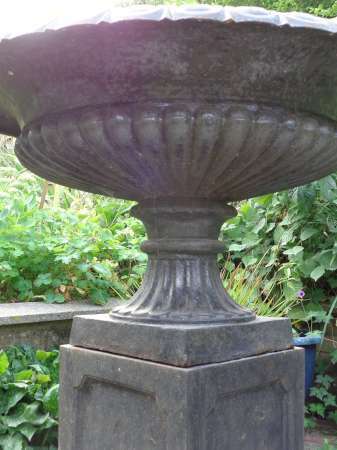 A few small losses to integral mouldings – see images. 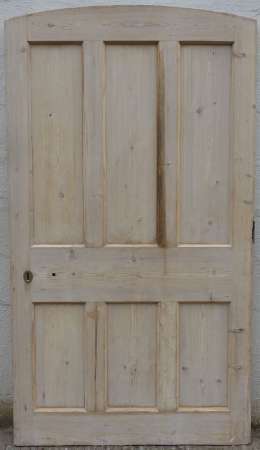 Victorian 6 panel pine door. Heavy duty for interior or exterior use. 2105mm x 900mm x 55mm. A fine set of pine room dividers or shutters reclaimed from a Georgian manor house. 2145mm in height x 4253mm total width x 27mm. 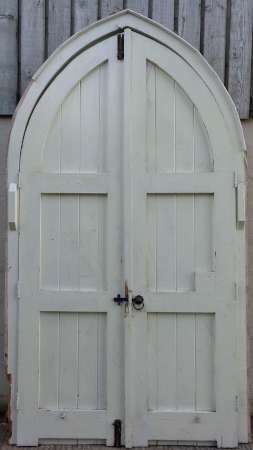 A pair of Victorian arched church doors in pine with frame. 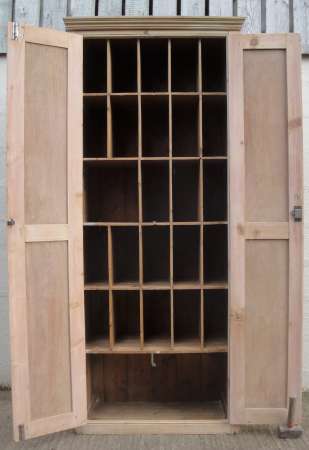 Doors were internal and so in good condition; frame needs repair on one side ( see image). 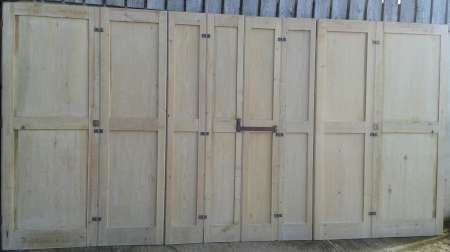 Doors – 2685mm x 1390mm x 45mm. Frame – 2800mm x 1575mm x 135mm. 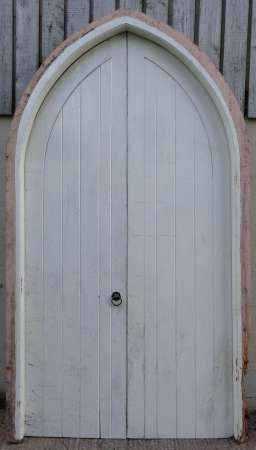 A Victorian arched church door with frame. 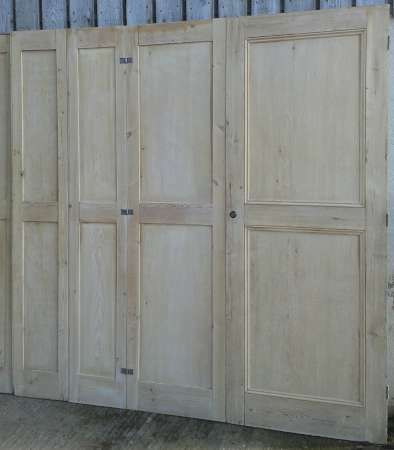 Door – 2145mm x 782mm x 55mm. Frame – 2220mm x 905mm x 130mm. 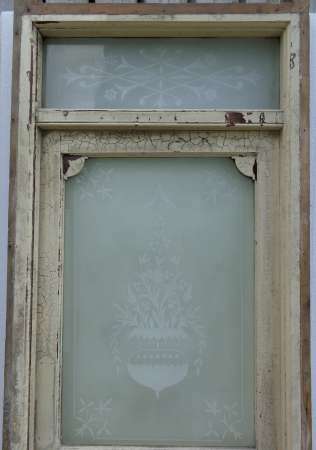 Victorian etched glass front door with etched fan light and original frame. Overall dimensions – 2355mm x 930mm x 105mm. Great condition with no rot. 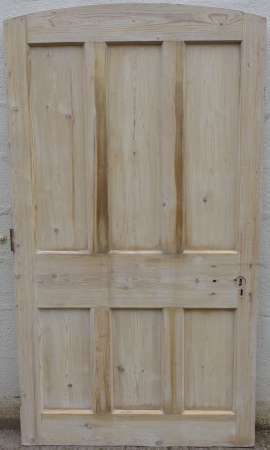 Large Victorian 6 panelled pine door. 2220mm x 990mm x 55mm. Originally used internally but ideal as an external door. A Victorian pine front door. 2005mm x 800mm x 40mm. 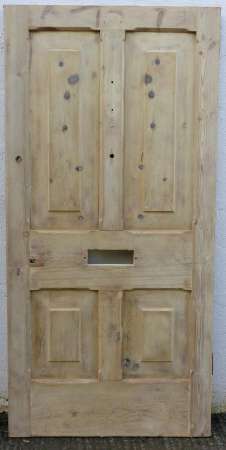 A 1930s pine front door – currently glazed. 2020mm x 815mm x 45mm. 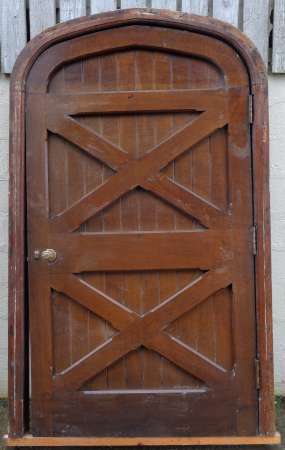 A 1930s pine front door. 1947mm x 787mm x 45mm. 2013mm x 901mm x 44mm. 1994mm x 810mm x 45mm. 1930s pine front door with hardwood panels. 2032mm x 763mm x 45mm. 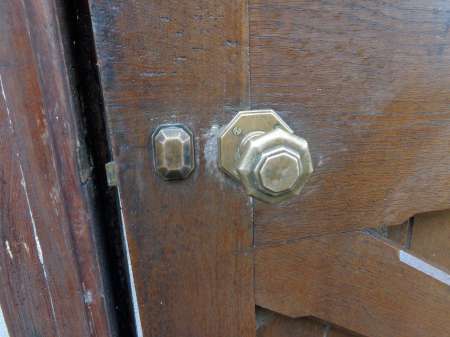 Great condition – this door has never been hung and no cracks to glass. 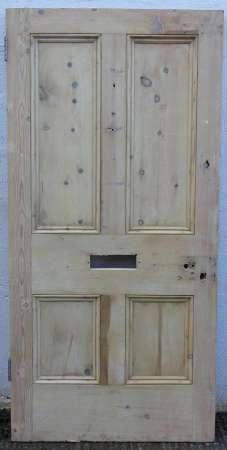 Mid – Victorian framed ledged & braced pine door. 1760mm x 809mm x 33mm. Stripped & in very nice condition. 2099mm x 905mm x 48mm.